A study of the way mouse embryos attach to the womb may one day lead to an improvement in the conception rates of women having IVF. University of Manchester scientists say mildly stressing an embryo might result in an increased likelihood of successful attachment to the womb. The results, funded by the Wellbeing for Women charity and published in the journal Reproduction, were exactly the opposite of what the team expected. Stressed embryos, they found, were more likely to successfully burrow down and firmly embed themselves into cells from the womb. The figure fell from 70 percent in stressed embryos to 30 percent for unstressed embryos. The stress was caused by repeatedly moving embryos in and out of a solution which caused them to loose water and shrink. According to the team, this process of shrinking and re-expanding may alter the embryos in a similar way to natural conception, making them more likely to successfully implant into an artificial womb. However, the team did not investigate other ways of stressing the embryos such as exposing them to heat or cold. "These results are unexpected but there's currently no indication that stressing a human embryo is advisable in a clinical setting," said lead researcher Dr. Peter Ruane. "But these findings are fascinating and, if we can work out what is going on inside these embryos, it could open up a whole new area of research which might one day lead to improved success rates for women receiving IVF treatment." He added: "Intuitively, you would think that environmental stress would have a negative impact on embryos and the IVF process. "But according to our study, that could actually be a good thing and that's really exciting. Professor John Aplin, who was on the research team, said: "This research is still at an early stage and we don't yet know what impact this type of stress could carry forward into the embryo's later development. "But it does seem as though the repeated stress alters the embryos, perhaps motivating them to seek out a stress-free environment in the womb and settle down. "Could it be that a certain level of stress is helpful for implantation?" Professor Daniel Brison, a clinical IVF embryologist involved with the research added: "The average success rate for women under 35 who start an IVF cycle is around 30 percent. "And the chances of success in IVF currently depend on the age of the patient having treatment and the underlying cause of infertility. So there is clearly a need to improve the process. "Despite significant efforts to ensure an ideal environment for the growing embryos, embryonic exposure to some forms of mild stress is largely inevitable during the IVF process. The fact that this could actually be beneficial is fascinating. 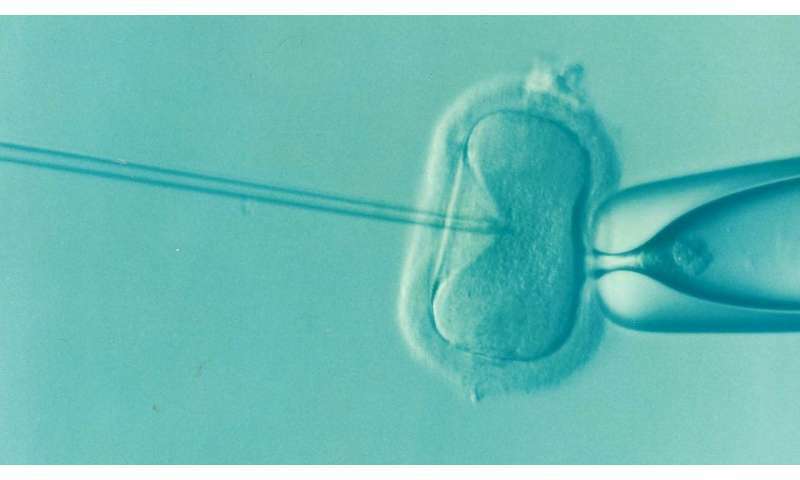 "But we now need to work out what changes are taking place inside these stressed embryos and to see if the changes can be harnessed to increase IVF success rates, particularly for patients who have experienced repeated IVF implantation failures." CEO of Wellbeing of Women, Tina Weaver, said: "One in seven couples struggle to conceive yet less than a third of cycles are successful which can have a devastating affect both emotionally and physically. "Wellbeing of Women is determined to help those trying to start a family by supporting pioneering research like Dr. Peter Ruane. Although at an early stage, this exciting work could pave the way to better conception rates giving families the babies they dream of."